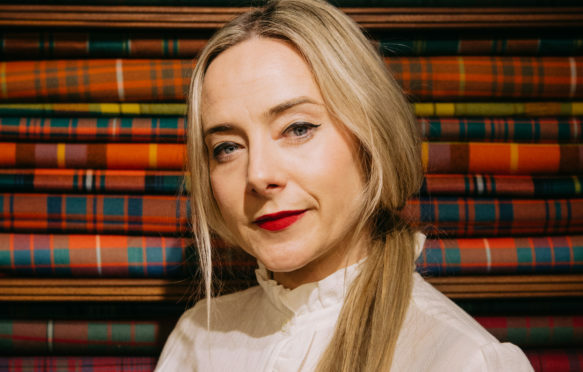 She has already breathed new life into Scotland’s oldest bespoke tailors, now Victoria “Vixy” Rae hopes to do the same for the country’s fabrics industry. The boundless enthusiasm the Edinburgh businesswoman has shown in injecting fresh energy into the capital’s Stewart Christie tailors is evident as she chats about changes she feels are needed for our manufacturing division. “There is so much tartan and tweed being made elsewhere,” said Vixy, who took over the almost 300-year-old New Town business in 2015 with partners. “Tourists are coming here and buying it, but it’s not all made here. I’m all about awareness and craft, so people should find out where their tartan and tweed is coming from. “I’m working on developing a Scottish Vocational Qualification, because we don’t currently have a bespoke tailoring qualification, and setting up an apprenticeship with us to go alongside it, like Savile Row. “I feel there is so much skill in Scotland and we need to grab on to that, both male and female. “There might be school leavers who don’t know what they want to do, yet there are a lot of factories closing down and I hope to change that. So, too, is there a renewed interest in tartan, which is undergoing a fashion revival. The luxury houses, including Versace, Simone Rocha, Vivienne Westwood and Paul Smith, marched tartan up their winter catwalks and the worldwide popularity of TV series Outlander and Netflix film The Outlaw King have also given it a boost. “There are some amazing things happening with tartan at the moment, like Prince Charles’ textile programme at Dumfries House and the work of the Hawick Tartan Company,” said Vixy. Vixy is currently working on a book, The Secret Life Of Tartan: How A Cloth Shaped A Nation, which is out later this year from Black & White Publishing. It will go behind the scenes to cover the types and styles of tartan, exploring colour, craft, texture and cloth, and featuring the people behind the cloth – families, weavers and designers. “I feel honoured to be asked to write this book. “When I was growing up in Edinburgh, I didn’t really enjoy tartan – I thought it was tacky. “I’ve always been against the mainstream and I do feel a lot of the amazing work being done with tartan is quite underground. “I’m passionate about colour, so I want to develop a tartan with a painter, create one that is aesthetically beautiful. I would also like to do an experiment with some natural dyeing. “Tartans used to be made with vegetable dye and I would like to work with some graduates from Edinburgh College of Art using natural dyes from avocado, onion, loganberries. “So many chemicals are used in the process now yet we have so many natural dyes around us in Scotland, amazing colours from things like bracken and peat. “Convenience has made it something that doesn’t happen, but we need to slow fashion down, think about the environment. “The fashion industry terrifies me in the way that it is going and it needs to be addressed. “Fast fashion is killing the planet. We need to slow it down. Coming from a streetwear background, Vixy ran the Dr Jives and Odd One Out retailers, and later became head ladies’ designer at fellow Edinburgh business, Walker Slater, for six years. When she and co-worker Dan Fearn heard that Duncan Lowe, the fourth generation of his family to run Stewart Christie, was retiring, they decided they had to step in. “It’s such an institution and we couldn’t see it close down. “There is so much heritage there. We have these beautiful books dating back to 1720 detailing the business. “Sir Walter Scott was one of our customers – we have an invoice from him. “This is heritage that can’t be bought and we don’t feel like the owners, we feel like custodians. “I’ll be digging into those archives for the book, which will focus on 18 tartans and the background and stories associated with each of them. Since coming in to Stewart Christie, I’ve introduced a ladies’ collection, 10% of which is tartan and the rest is tweed. I have judges, models, business ladies, aged from 18 to 85, coming in. Vixy also made history recently by being the first female to be made a member of The Incorporation of Edinburgh Tailors, a trade body that dates back more than six centuries. “They needed some energy, I think, but it was quite terrifying at first to be sitting round a table with 12 older characters. “It’s very old school, but it’s something I’m proud of,” she said. The same can be said for Vixy’s love of tartan and all its traditions. Oscar nominee Saoirse Ronan was pictured wearing a tartan capelette from Vixy’s ladies collection at the Mary Queen Of Scots film premiere at Edinburgh Castle in January. Stewart Christie and Co were dressing Saoirse’s co-star, Scottish actor Jack Lowden, when Vixy offered her the piece to combat the brisk weather. “She was wearing a beautiful Dior dress but I told her it would be cold up at the castle, so I offered her the capelette,” Vixy smiled. Vixy will rub shoulders with another A-lister when she travels to New York for the annual Tartan Day celebrations next month. Billy Connolly has been announced as the Grand Marshal of the parade through Manhattan, leading around 1,500 people through the city’s streets. Vixy said: “I was absolutely delighted to hear the news and I’m looking forward to meeting him. “He’s the perfect fit for this and I’ve always wanted to meet him. “He was a great admirer of my step-grandfather, Norman MacCaig, and I hope we can have a giggle on April 6. “And of course, I will offer him a bespoke tartan piece, as it would be such an honour for Stewart Christie & Co to add to some of our greats.